America had some very rough times in April. The Boston bombing was a terrible day & was too quickly followed by the horrible explosion in West, TX. While my heart was (and still is) focused on all those affected by the Boston bombing; I was especially saddened by the explosion in the small, Czech community of West. Many Texans will be quick to tell you that if you're road tripping from Austin to Dallas, a must-do is to drop by the Czech Stop to pick up kolaches. From savory sausage to sweet apricot their kolaches are tasty, tatsy. They're amazingly comforting & stepping into their shop feels like home. That may be because I'm from a small German community in Texas, but still, it's small town quirks like that are a large part of what makes Texas such a great state. I want to do my part to help West, TX begin to pick up the pieces & rebuild their homes, & lives. And what better way to do that, than to participate in efforts that speak to my baker wanna-be soul? 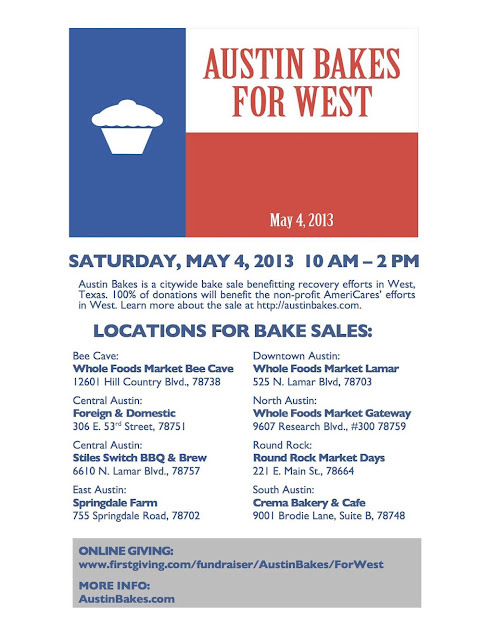 Austin Bakes, the great folks that put together bake sales around Austin a while back from Bastrop are now putting together a city-wide day of selling handmade goodies for West. All of the funds raised will be going to AmeriCares relief efforts in West. It's all happening this Saturday from 10AM - 2PM. There are bake sale stations going up all over town, so find the location nearest you & buy, buy buy! Many of your favorite food bloggers & even some restaurants & bakeries will be bringing their treats to sell. I'll be contributing Cheddar, Chive & Bacon scones, & a TBD sweet treat, along with some goodies I'll be baking up for a family-focused blog I contribute to, Rocotillo. I'll also be volunteering at the sale at Crema Bakery on Brodie Lane, so be sure & say Hi!